During the past week, I have had time to reflect on my past year – the good and the bad – and think about running goals for the spring of 2016. I am not setting a resolution as I have never been a big fan of them. But chasing a dream, setting a goal to achieve it, and becoming better for it: I am all about that. But, like many others, I go through periods when sticking with those goals is tough. Family life can take over; work might get busy; I might be side-lined with illness or some type of ache/pain. So I have a couple of tricks to help myself stay motivated and work towards becoming better. a. Make a Commitment to Others: For almost a year, I needed two of my training partners – Kelly-Lynne and Monica – to l ure me to the Yoga Studio. Don’t get me wrong; I like yoga, but I don’t love it. I do it because it is good for me. Between the three of us, the texts would fly during the week to figure out who could go to Friday night’s class and who couldn’t, who had to work late and who didn’t. Nine times out of ten, if neither of them could make it, I would find something else to do. But the more I went with one or both of the girls, the more comfortable I became to the point where I now make the effort to go to yoga on my own. And, by the way, my fitness goal for the winter is to strengthen my core so I will definitely be frequenting more often. b. Put Your Goal in Writing: This works for me and the more people who see it, the better off I am. Write your goal down and post it in a spot where you will see it again and again: on the fridge door, on the bathroom mirror, at the top of your desk at work. The more you see your goal, the more likely it will become a part of you. c. Register for a Race: If you are a runner and want to run a 10K in the spring, find one now and register for it. By doing that, you have made a formal commitment to yourself and you have put it in writing. My husband talked about running at The Eggnog Jog when I race many, many times until I finally asked him, “Do you want me to register you for it?” Once I did, the talk stopped and the training started. Registering gave him the little bit of motivation that he needed to start running again. d. Involve Your Family: I cannot stress how important this is – especially if you have young children. When my boys were little, planning the week on Sunday nights also meant writing out the days that I would run and the type of workout that I planned. Then, when I got home from work, they already knew whether or not I was going for a run. That reduced the meltdowns at home and it led to my sons’ encouragement and support in my own fitness goals. e. Join a Club or a Group: This ties in with making a commitment to a training partner. The advantage of running or working out with a club or a group is that it will always be there and ready for you – even if your friends can’t – and you are likely to make some new friends with the same goals as you. I love training with Lions Valley Athletics. Even though I am the slow one in the group, I am always supported and encouraged by the others in the group, and I have made some great friends. This is a few of us at a training run back in August. And, in case you are wondering, I made some great friends – including my yoga buddies above – through my former club, Toronto Olympic Club, and through Lions Valley Athletics. As I mentioned above, my goal for 2016 is to build a stronger core. Rather than focussing on it once or twice a week, I am changing my game plan: 20 in 16. In other words, I am going to do 20 minute core workouts over 16 days in the month. I have started a Facebook group – 20 for 16 – which people can join, set their own goal (e.g. 20 minutes of cardio, abs, strengthening, walking…. ), and we can all support each other on FB or Instagram. You can check out more details on Cynsspace . If you want in, leave a comment below. Being better than you used to be: that is what resolutions are really about. There have been several key players – runners and non-runners – behind me during my training cycle but it has been my family (Dave, The Oldest Dude and The Littlest Dude) who have been behind me every step of the way. Recently, they have been beside me too. I didn’t truly recognize the support that the boys were giving me until the past week. Since it was the last week of summer vacation, or the week before school starts, I had been at school every day to get my classroom ready. As bad timing had it, my husband decided to go away for a few days to Northern Ontario. While I admittedly enjoyed being able to hog the bed and sleep diagonally each night, I was a little stressed about having the boys on my own while getting things set up for school. The combination of busy days, a working teen, a heat alert, an absent husband and the beginning of the last build-up towards the Chicago Marathon were bound to end in disaster. What a poser! Taking a break from another hot weather (37C) run. They understood and it immediately showed. The next day, I headed out into the trails for a late afternoon run, with the humidex hovering around 37C. The oldest dude met me half-way with water and Gatorade, and he managed to take some pictures of me running. Two hot runs with a yoga class in the middle. Yesterday, I had two shorter runs planned with a yoga class in the middle. When I was about to head out the door for my second run of the day, The Littlest Dude called out, “Wait! How far are you going? Can I come with you?” He strapped on his helmet and stuffed my phone in his pocket. Half way through, we stopped so he could take pictures; using my phone has become a real treat for him. It was my husband’s turn to shine today. I got home from school and discovered that he had done some dusting – the first of the three jobs he has for the week. After I have been doing all of the cleaning for the past two months, it was a relief to have someone else take over part of it. From the beginning of my training for Chicago, I knew that the start of the school year while finishing my marathon build-up was going to be a challenge. Today, I have finished Week 1 of the three most difficult weeks. Everyone at home is doing what they can to take away some of the day to day tasks and keep me running. All I need to do it keep chasing my dreams. When I registered for the Chicago Marathon, I had forgotten how hard it can be to train through the summer heat. Well, I didn’t entirely forget but I shrugged it off, thinking that this would be a typical summer with empty promises of hot weather. Let’s keep in mind that this is Canadian hot – so nothing near the hot, dry heat that is felt through many parts of the United States and other parts of the world. In Southern Ontario, I have to get up by 6:30 so that I can run in cooler temperatures, not at 4:30 like my Floridian friends. But it’s all relative. 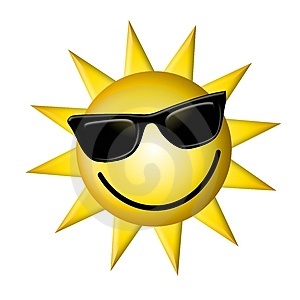 This past week, we had the first real heat wave that we have had in two summers. On most days, temperatures were around 32 degrees (about 90F) but, when you added the humidity, it felt like 38C (about 100F). What exactly does that mean? At my hot yoga class on Monday night, they turned off the heat, closed the curtains to keep the sun out and we still walked away drenched; even then, it was hotter outside than it was inside. Training-wise, the heat took its toll on me. I ran my long run on Sunday and went through two bottles of Gatorade and lots of water in the 6 hours that followed; that was a personal record. On Monday, I went to hot yoga at Power Yoga Canada; I trained with Lions Valley Athletics on Tuesday night, another sweat drencher. On Wednesday night, due to family commitments, I kept my run short – 8K in feels like 35C heat. By Thursday, I was done. I had had it with the heat. It, quite simply, had tired me out. My feet were slightly swollen and I wasn’t sleeping well at night. On Thursday, when the Littlest Dude asked if we could spend the whole day together, which meant no running for me, I knew it was time to take a day off. I needed the physical break but, more importantly, my son needed me. Of course, I stressed over this. I knew that the day off alone wouldn’t matter in the big picture but I worried about the drop in my weekly mileage. I started to calculate ways to make it up over the rest of the week. “Do I need to drop mileage next week too?” I wondered. And what about next week’s mileage? “ENOUGH! It doesn’t matter. It is one lousy day. And it is one day that, for whatever reason, the Littlest Dude wants to spend with you.” My inner voice set me straight. And, as the week is wrapping up, the day off didn’t matter. I ran yesterday and today, as planned, and I will tomorrow. What matters is the Littlest Dude and making sure that he realizes that I am there for him when he needs me. And when I do head to Chicago, he will be there, looking out for me. A lot of people ask me how I find time to run. It’s simple. I don’t find time; I make time. Every run has to be scheduled into my day, around work and around family. There are some days that this means getting up at 5:30 in the morning and running in temperatures colder than 20 below and others when I head out the door after 9:00pm. I love running in the summer because, as a teacher, I have more flexibility and can schedule other activities around when I want to run. 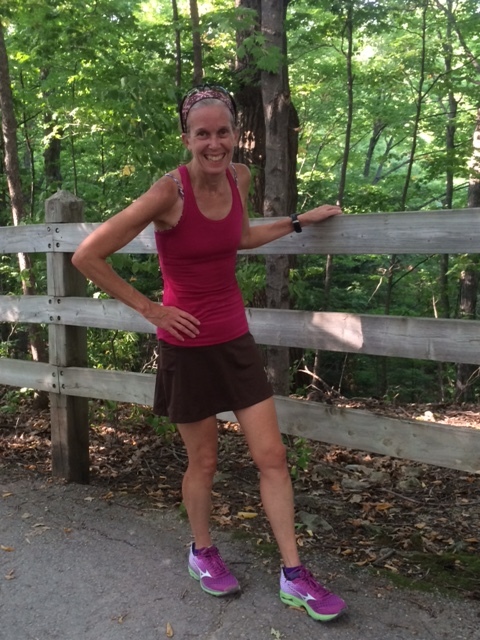 Last Saturday, as on many Saturday mornings, I headed out for my long run before my husband and boys got up. When I got home, things were different; I was greeted with panic by the other early riser. “Where were you?” the littlest dude asked. “I thought you were kidnapped!” I promised that if I left again when he was asleep that I would leave a note telling him when I would be home. 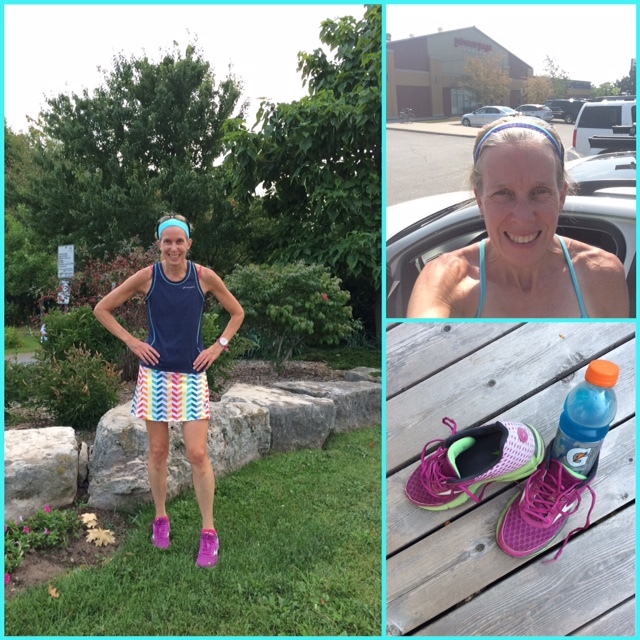 This weekend, I made time for my long run on Friday night as Southern Ontario faced a heat warning all weekend. This meant that I would avoid the worst heat but would also have more time for the boys on the weekend. 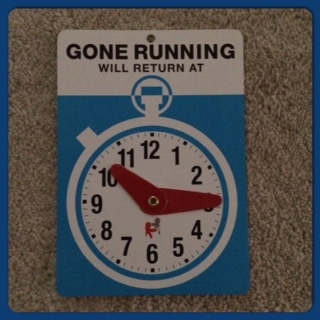 On Saturday morning, with Dad and the boys still asleep, I was heading out the door for a short run, when I suddenly remembered: “I promise I’ll leave you a note or my running clock.” I set the time for 10:15, left the clock at the bottom of the stairs and headed out the door. When I got home, I was later than expected but things were okay. The littlest dude saw my note, his brother was up with him and not a word about my absence was mentioned. I was off the hook. It is only a matter of years before this scenario will be reversed, when my sons are out at night (not morning) and I will be wondering when they’ll get home. Right now, I’m loving these years when they are looking out for me.